Higurashi no Naku Koro ni Kai (ひぐらしのなく頃に解, Higurashi no Naku Koro ni Kai?, lit. When Cicadas Cry Solutions) is a Japanese murder mystery dōjin soft sound novel series written by Ryukishi07 and produced by 07th Expansion. The series is serves as a sequel to Higurashi no Naku Koro ni and contains "answer arcs" that correspond with the "question arcs" from Higurashi no Naku Koro ni. Each answer arc explains the mysteries presented in its respective question arc. 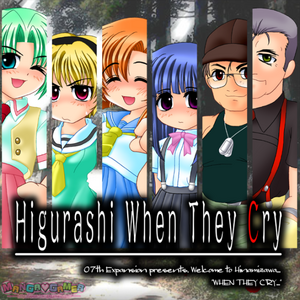 Higurashi is a murder mystery game described as a "sound novel" by 07th Expansion. A sound novel is similar to a visual novel in that the gameplay requires relatively little player interaction as most of the game is composed of text dialogues. The original release contained no voice acting for the characters. While a visual novel's basis would be the visual aspect, as the name suggests, a sound novel's basis takes more care in producing an atmosphere via the music, sound effects, and the story itself. This page was last edited on 28 May 2017, at 02:43.